Thanks to the FAA’s BasicMed program, along with free tools from AOPA, you can keep flying, and leave your medical certificate behind. 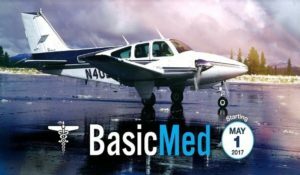 Once you’ve completed the program requirements, BasicMed allows you to fly with a valid state-issued drivers license and your pilot certificate. No more medical required. Finding out if you qualify is pretty easy. Just fill out 4 questions in AOPA’s BasicMed qualification tool, and you’ll know if you qualify. And if you don’t qualify right away, the website guides you through what you need to do to qualify for the program. So what can you fly under BasicMed? And as long as you’re rated, you can fly VFR or IFR. However, pilots flying under BasicMed cannot operate for compensation or hire, and must operate within the United States, unless authorized by the country where the flight will be conducted. What Are The Rules To Stay In BasicMed? To stay in the program you’ll need to visit a state licensed physician at least every 48 months. During the visit, your doctor will perform an examination and affirm the absence of any medical condition that could interfere with the safe operation of an aircraft. In addition to that, you’ll need to take the free online medical education course every 24 calendar months. Make sure you meet the flight review requirements of FAR 61.56 and any other applicable flight or instrument proficiency requirements to act as pilot in command.